Over one-hundred Lone Soldiers gathered in Tel Aviv to celebrate the 6th night of Hanukkah with 2012 Tennis Paralympics Gold Medal Winner. Over 100 Lone Soldier Olim from all over the world gathered in Tel Aviv on Thursday, December 13, to celebrate the 6th night of Hanukkah with 2012 Tennis Paralympics Gold Medal Winner Noam Gershoni. 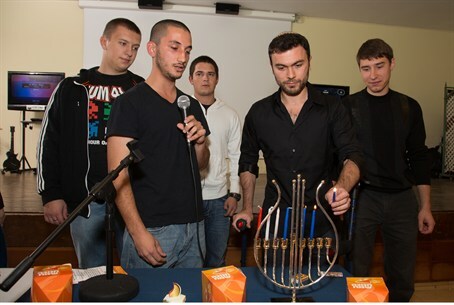 Together they celebrated Hanukkah, while enjoying traditional sufganiyot, latkes, drinks, music and candle lighting. Gershoni was a fighter pilot in the Israel Defense Forces who was severely wounded during the Second Lebanon War. His gold medal at the 2012 games in London was Israel’s first gold medal in the Paralympics games. “As someone who was born in Israel, serving in the army is something I always wanted to do and something that was natural to me,” said Gershoni. “But to live abroad and make Aliyah to Israel as an adult with the clear aim of joining the IDF and protecting the State of Israel is probably the highest level of Zionism and love of Israel that I know. “These Lone Soldiers deserve all the respect and admiration in the world for what they are doing,” Gershoni added.